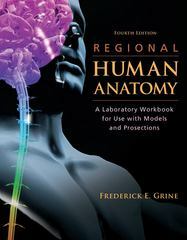 Regional Human Anatomy: A Laboratory Workbook for Use With Models and Prosections 5 Edition The Grine Lab Workbook is designed for the Human Anatomy Lab course and takes a Regional approach as opposed to a systems approach. This approach is becoming more and more popular as a way to teach Human Anatomy. Instructors who use a lab book with a "regional approach" and combine it with a text that takes a "systems" approach offer their students a combination that serves to reinforce anatomical knowledge since it forces the student to see each anatomical structure from two perspectives. Grine can be used effectively in conjunction with a lab course that uses human cadavers since the content is presented in the regional sequence typically practiced in dissection.